Born in Venice, Maddalena Lombardini was the daughter of Pietro Lombardini and his wife, Gasparina Gambirasi, said to be impoverished members of the nobility. Impoverished they must have been, because in 1753 their daughter was accepted into the Ospedale dei Mendicanti--like other Venetian ospedali (hospitals), the Hospital of the Mendicants was a charitable organization focused on providing care for the sick and the elderly, and housing orphans and the poor. 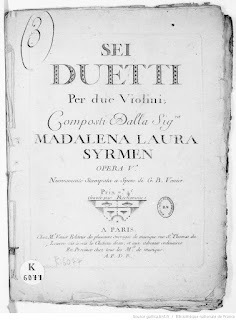 Maddalena Lombardini studied violin, showing enough promise that she was allowed to leave the institution in order to have private lessons with the composer and violinist Giuseppe Tartini in Padua. 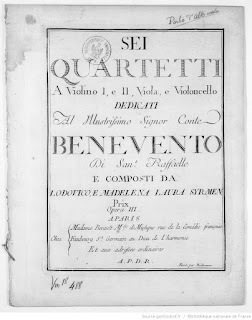 In 1760, Tartini sent his pupil a letter outlining his views on violin technique. Since the only way to leave the Ospedale was to marry, Lombardini remained there until 1767, when, at the age of twenty-one she married another violinist, Ludovico Sirmen. 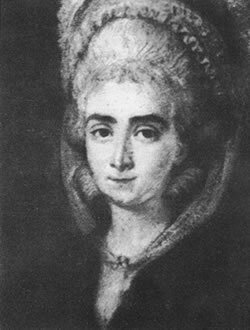 Unlike many women who married, Maddalena Sirmen did not give up her musical career upon marriage. Rather, the two, Ludovico and Maddalena, traveled together, performed together, and composed together. 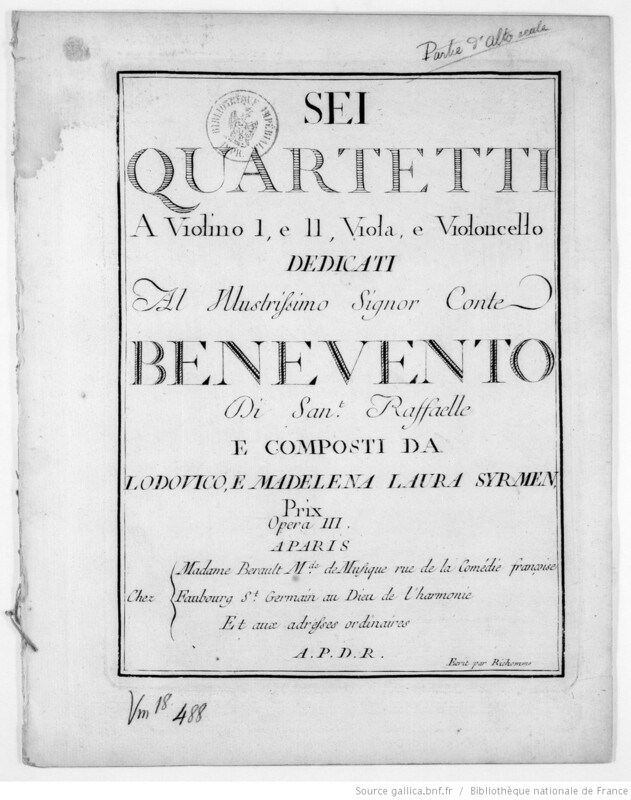 In 1768 they performed in Turin, then in Paris two months later, where they published six string quartets on which they had collaborated. Interestingly, Sirmen had her own intimate relationship, with a priest, Giuseppe Terzi, although the exact nature of their bond isn't clear. He traveled with her throughout her life, from her first tour with her husband after her marriage until her touring career ended, with her last performance in Paris in 1785. Sirmen returned to Venice after she retired from performing. Having maintained control of her finances throughout her career, she was a wealthy woman, though after the fall of the Venetian Republic in 1797, the value of Venetian currency fell, and her economic status declined precipitously. During her lifetime, Maddalena Sirmen's compositions were published in France, England, the Netherlands, Germany, and Austria, running through multiple editions, some remaining in print for decades after her death. Some musical scores are available online at International Music Score Library Project, which you can access by clicking here. There are several performances of Sirmen pieces available on YouTube--rather than linking to them, I'll let you sample. (And there are a couple of CDs available, like this one.) 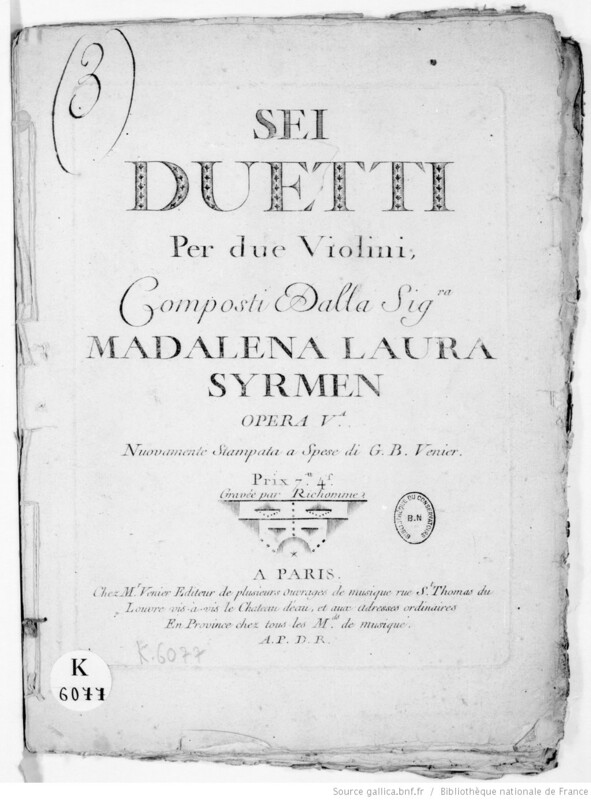 Elsie Arnold and Jane Baldauf-Berdes's biography, Maddalena Lombardini Sirmen: Eighteenth-Century Composer, Violinist, and Businesswoman is also available (though very expensive).